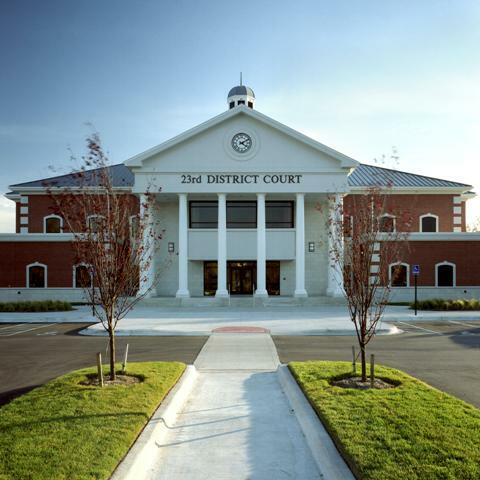 23rd District Court, Taylor, MI - Redstone Architects Inc.
Redstone Architects, Inc. was hired to lead the Design-Build Design Team for the Taylor Municipal Complex Improvements. The project consists of four projects designed and built fast-track. The projects were completed in the fall of 2005. The improvements included a new two-story Courthouse Building with three courtrooms and a jury assembly / training room. Redstone Architects worked closely with the City to coordinate the design efforts with its “New Urbanism” development strategies along Goddard Road. Redstone Architects developed 3-D computer aided design renderings of the existing municipal campus and new buildings in the design process to help the Client visualize the new look of the campus and make important decisions.